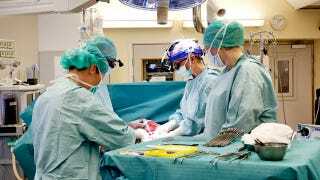 Doctors in Sweden say nine women have successfully received transplanted wombs and will soon try to become pregnant. But the radical new procedure, which relies on donations from living relatives, has its critics. To date, no baby has ever been born from a transplanted womb. Two previous attempts, one in Saudi Arabia and one in Turkey, both failed to produce babies. But the new procedure, which is 10 years in the making, appears to be quite promising — so promising, in fact, that embryos may be planted later this year. The nine recipients, who were either born without a uterus (a condition known as Mayer-Rokitansky-Küster-Hauser syndrome [MRKH]) or had it removed because of cervical cancer, are all doing well. The Swedish surgeons, led by Dr. Mats Brannstrom, did not connect any of the women's uteruses to their fallopian tubes, meaning they can't get pregnant naturally. But they all have their own ovaries and can make eggs. So, prior to the operation, each of them had some removed to create embryos via IVF. The embryos were then frozen in anticipation of being transferred into the new wombs where they'll be carried to full term. Fertility experts say it's an important step forward, but they're not sure if the transplants will result in healthy babies. There's also concern about how the procedure is being done. "Mats [Brannstrom] has done something amazing and we understand completely why he has taken this route, but we are wary of that approach," said Dr Richard Smith, head of the UK charity Womb Transplant UK, which is trying to raise £500,000 to carry out five operations in Britain. He said a womb transplant was like a radical hysterectomy but it required a bigger chunk of the surrounding blood vessels to be taken to ensure adequate blood flow, raising the risk of complications for the donor. Smith said British officials did not consider it ethical to let donors take such chances for an operation that is not considered life-saving. Smith said the biggest question was how any pregnancies would proceed. All of the women who received womb transplants will need to take anti-rejection medicines, but Smith said data from women who had received kidney transplants did not suggest their babies were at any increased risk from the drugs. That said, the wombs will be removed after a maximum of two pregnancies so the women can be taken off the anti-rejection drugs, which can cause high blood pressure, swelling, and diabetes. What's more, the work is strictly being seen as a research study. As Brannstrom noted, "It could lead to [the women] having a child, but there are no guarantees … what is certain is that they are making a contribution to science." This is all quite amazing — and it'll truly be a major step forward for science and personal reproductive autonomy if and when the first baby is born as a result of this procedure. At the same time, however, it does feel a bit... privileged. Image: University of Goteborg / Johan Wingborg. Related: Exosomatic wombs | Too many c-sections in the US? Are Women Having Too Many C-Sections in the United States?